Stop for the Legend. Stay for the day. Here, at the site of the twice life-size Buffalo Bill Bronze sculpture, we commemorate the legendary story of the 1868 contest between William F. Cody and William Comstock that took place here in Logan County near Oakley, Kansas where Cody earned his title “Buffalo Bill”. The monumental sculpture stands 16 feet and weighs 9,000 pounds. Spend the day and stay the night! Oakley offers activities for everyone. Play our 9-hole golf course or visit one of our three city parks and take a ride down the slide at the “Cool Pool” swimming pool. Stop in at the bowling alley and Family Fun Center. Take time out on the weekend to catch a movie at the local, student-run theater. Bring the family in July to our county fair and locally run carnival and come back in the fall and winter for upland bird, turkey, or deer hunting. With plenty of hotels, motels and RV and camping facilities, Oakley has room for all. Oakley is 4 hours to Denver, 5 hours to Kansas City, 6 hours to Oklahoma City, 5 hours to Amarillo and 2 ½ hours to North Platte. 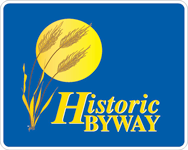 The town of Oakley is located at the apex of Kansas’ first designated historic byway. The Western Vistas Historic Byway covers 102 miles of history going west from Oakley on US 40 and south from Oakley on US Hwy 83.